Chief Opechancanough (O-pech"un-kä'nO) of the Powhatan Confederacy. 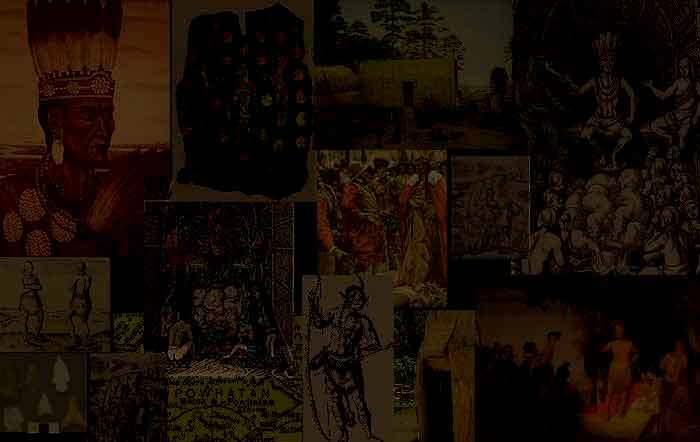 Part of the Powhatan Confederacy pages of the Native American topic found within the Va and Our Virginians Chapter of Volume I, Our American Immigrants, contained in the two Volume Within The Vines Historical Family Website. Opechancanough is relevant to the J.amestown Pages and specificallythe Piersey Family and Woodson family studies within the Howard and Allied Lines , which, with the Swope and Allied Lines, forms the basis of the Within The Vines Study. AKA Don Luis de Valasco. Younger brother and successor to Chief Powhatan (Wahunsonacock). Openchancanough, Chief of the Pamunkey, was King of The Powhatan Confederacy from 1618-1644. Half brother to Wahunsonacock [known to the English as Chief Powhatan ] Openchancanough was responsable for the abduction of Captain Smith in 1608 and for both the massacre of 1622 [which Abraham Piersey, and both John Woodson and his wife survived] and the massacre of 1644 [in which John Woodson was killed]. More militant than his older brother, Opechancanough is a complex, historically fascinating charactar and brilliantly adept strategist responsable for what is arguably the most succesful attack against white incursionists by any Native Americans in all of American history. Within the history of Spain is the remarkable story of a young American Indian abducted in the 1560s by the Spanish along the Virginia coast, found as Don Luis de Velasco in contemporaneous Spanish records. He was well educated in Spain and travelled in Mexico. On return to his native peoples in the 1570s, and in the company of missionaries under Fray Segura [Father Juan Baptista de Segura] he assumed the position of power which was his birthright within the tribe. Some purport that this Don Luis de Valasco was Powhatan's father, or uncle, but many now feel Don Luis de Valasco was Powhatan's half brother Opechancanough, Footnote1 whose name meant "He whose Soul is White" in the Algonquin language. What is certain is that this Don Luis de Velasco gave to the Powhatan Confederation some background regarding the European civilizations, power and intent. The period of sleepy understanding that the natives around Jamestown were subservient was torn asunder by Opechancanough's suprise attack of 1622 igniting the Second Anglo Powhatan War and known in white history as The Good Friday Massacre . This expertly mounted suprise attack was partially but substantially mitigated through intelligence recieved the night before from a Christianized Indian present in the colony-If not for the intelligence the entire colony would surely have been destroyed. After retaliatory forays and brittle relations, an uneasy peace ensued with the signing of the treaty of 1632. One decade later this treaty was shattered with Openchancanough's last meaningful act as Chief , involving the action of 1644, likewise known as the massacre of that year, which action was the cause for his capture, imprisonment and death as a very old man. It also marked the beginning of the third and final Anglo Powhatan War. Openchancanough, (O-pech"un-kä'nO), Indian chief of the Pamunkey Tribe , later chief of The Powhatan Confederacy, AKA Don Luis de Valasco. Younger brother and successor to Chief Powhatan (Wahunsonacock). Openchancanough, Chief of the Pamunkey, and King of The Powhatan Confederacy [after the death of his half brother Wahunsonacock known to the English as Chief Powhatan], was responsable for the abduction of Captain Smith in 1608 and for both the massacre of 1622, occuring shortly after his ascendancy [which both John Woodson and his wife survived] and the massacre of 1644 in which John Woodson was killed. More militant than his older brother, Opechancanough is a complex, historically fascinating charactar and brilliantly adept strategist responsable for what is arguably the most succesful attack against white incursionists by any Native Americans in all of American history. Within the history of Spain is the remarkable story of a young American Indian abducted in the 1560s by the Spanish along the Virginia coast. He was well educated in Spain and travelled in Mexico. On return to his native peoples in the 1570s, and in the company of missionaries under Fray Segura [Father Juan Baptista de Segura] he assumed the position of power which was his birthright within his tribe. Some purport that this Don Luis de Valasco was Powhatan's father, or uncle, but many now feel Don Luis de Valasco was Powhatan's half brother Opechancanough, Footnote1 whose name meant "He whose Soul is White" in the Algonquin language. What is certain is that this Don Luis de Velasco gave to the Powhatan Confederation some background regarding the European civilizations, power and intent. The period of sleepy understanding that the natives around Jamestown were subservient was torn asunder by Opechancanough's suprise attack of 1622 igniting the Second Anglo Powhatan War and known in white history as The Good Friday Massacre [the suprise being partially but substantially mitigated through intelligence recieved the night before the attack from a Christianized Indian present in the colony in absence of which the entire colony would surely have been destroyed]. An uneasy peace ensued with the signing of the treaty of 1632, followed one decade later by Openchancanough's last meaningful act as Chief with the action of 1644, likewise known as the massacre of that year, which action was the cause for his capture, imprisonment and death, a very old man, and the beginning of the third and final Anglo Powhatan War. While we have come to believe that Powhatan was the holder of the native power in Virginia, Carl Bridenbaugh in his book published 1980 and entitled "Jamestown 1544-1699" reveals his younger half brother Opechancanough as the formidable force behind the throne. A prince of "large Stature, noble Presence, and extraordinary parts, " Opechancanough's own history is fascinating and informative. Like his famous neice , Opechancanough travelled to Europe, having been taken there in 1561 by a Spanish ship appearing on the Chesapeake, and he remained 5 years in Spain. Apparantly homesick for his people, he was sent instead to Mexico where he remained three years and from which he returned to Spain for another three . In all he received 8 years of education from priests, and invaluable insight into the intent , methods and stregnth of the European powers. On his return to his people, and in company of Jesuit Missionaries under Frey Juan Baptista de Segura, he became again more Indian, taking on "multiple wives for which he was reprimaded and humiliated by the Jesuits. He eventually denounced Christianity, led a raid, and killed the priests. After that, he terminated all contacts with Europeans and Christianity" 1. The Jesuits involved are currently being petitioned to sainthood. 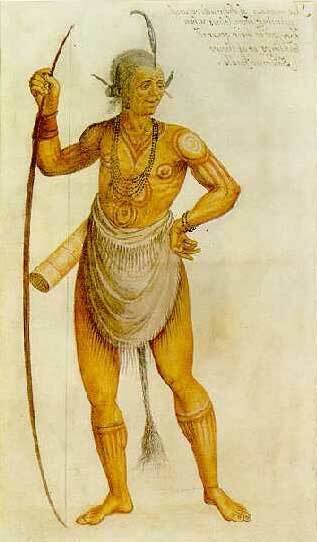 On the death of his brother in 1618, Opechancanough soon became chief and was already an ageing man. Bridenbaugh discusses Opechancanough's strategies before his accensionFootnote 3, but, once chief, intent on halting both cultural deconstructionism and loss of his homeland, he found in the english killing of a young brave [Menatanou] for the alleged murder of a Jamestown resident the incident to ignite his plans. He soon orchestrated the Good Friday Massacre of 1622 in which 347 colonists, men women and children, were victimsFootnote2. It was only through the intelligence offered by a Christianized Indian residing in the home of an Englishman and revealed on the eve of the attack that the entire plan to destroy the fort and all of the Jamestown colony was averted. The following is a portion of text entirely from the Review by Roy W. Johnson of Carl Bridenbaugh's book "Jamestown 1544-1699"
[New York: Oxford University Press, 1980 ISBN 0-19-502650-0 ] . Opechancanough, "Desiring to return to his people, he was placed on a ship to Mexico, but the Spanish governor refused to allow him to leave for the north. He spent three years in Mexico and undoubtedly observed that even those native Americans who were friendly to the Europeans were losing their culture and becoming second class citizens in their own former land. He then returned to Spain and furthered his education with the Jesuits for another three years. Eventually, he returned to his own land as a missionary and interpreter. However, he reverted to some Indian ways (such as multiple wives) and was severely reprimanded and humiliated by the accompanying Jesuit priests. He eventually denounced Christianity, led a raid, and killed his tormentors. After that, he terminated all contacts with Europeans and Christianity. "Opechancanough was, of course, correct in his belief that the English planned to seize Indian land. This was the whole purpose of the Virginia Company. Among the whites, there were two general groups. Most of the common men of the colony and some of theleaders had only contempt for the natives and saw them as an impediment to be destroyed. Other leaders, most of whom were Puritans, wanted to be kind to the Indians, "Christianize" them (which meant also teaching them English ways), and make them "loyal subjects" to their English overlords. Either way, their culture would be destroyed and they would lose control over lands their ancestors had ruled for centuries. "By 1613, Bridenbaugh believes, Opechancanough had concluded that the English colony was intended to be permanent and expand.His brother was the ruler, the tribes were not united and the other natives had to be convinced of the danger, so he had to work carefully. Opechancanough used every means to make the whites feel safe and secure while he was uniting the tribes, blending European and native American methods of diplomacy. In one instance, a neighboring tribe was reluctant to join his alliance. He encouraged the tribe to attack the whites , then warned the English of the attack, which therefore failed. The English thus thought of him as a friend, and the Indians became convinced that they could not go it alone. He attended the wedding of Pocahontas and John Rolfe and gave the bride away, possibly seeing the marriage as an additional way to buy time. "After Powhatan's death, there was a brief period of uncertainty, then Opechancanough himself became Paramount Chief, taking over the 'empire' of tribes that he had masterminded under Powhatan. By 1622, the influx of English was becoming alarming. He apparently believed the English to be so strong that only a telling and total blow would suffice to drive them away." For the following, great reliance is made on the Mariners Museum webpages involving Native Americans Post Contact. Much more information is available at that site. The English were well aware of the adversity of settling on already settled land. In the Instructions to the Colonists prior to departure in 1606, the crown advised on the mode of settlement and choice of locale featuring natural protection and with comment on natives : "they will grow discontented with your habitation,and be ready to guide and assist any nation that shall come to invade you; and if you neglect this, you neglect your safety." The English left their homeland 1606 , arrived to Jamestown in 1607 and soon encountered the Powhatan Confederacy and their Chief Powhatan [so named by the English; his Indian name was Wahunsonacock]. Despite parlays and presents [ including an English bed] , and the exchange of European goods [including coveted tools ] for desperately needed [vital] food in the early years of the colony, uneasy testing of each other's stregnth occured with the English ascertaining the Chief's power and possible enemies and weaknesses, and the Powhatan Confederacy conducting several small-scale raids against the new fort. Powhatan and English leaders came to realize that they both could benefit from peace. In May 1610, after the arrival of the survivors of the Third Supply's flag ship from Bermuda where it had been shipwrecked, and in new boats built on that isle, "Gates decided to evacuate the colony. Once they were on their way out to sea, they met the remainder of Lord de la Warr's lost fleete and were ordered to return to Jamestown. From 1618 there was a movement among certain of the company to incorporate the Indians into the society, to christianize them, and some were living in the town. Still the colonists in general disdained the natives. This in part no doubt led to Opechancanough's gathering fury, and his attempt to obliterate the colony can be seen as an attack at cultural deconstructionism as much as protection of territory. He had reason to object to the amalgamation of the natives into the Jamestown populace; His attack was thwarted by one so converted. "For some reasons, best known to the English government, in March 1622 the King of England had to remind King Powhatan of the articles of the treaty of peace existing between them, in answer to which King Powhatan said that he would prefer seeing the country turned upside down rather than break a single article of the treaty, but, as will be proved later on, this conduct of the savages was nothing but hypocrisy and deceit, they only awaiting a favorable opportunity to kill out the English. "Several days before this bloodthirsty people put their plan into execution, they led some of our people through very dangerous woods into a place from which they could not extricate themselves without the aid of a guide, others of us who were among them to learn their language were in a friendly way persuaded to return to our colony, while new comers were treated in an exceedingly friendly manner. "On Friday before the day appointed by them for the attack they visited, entirely unarmed, some of our people in their dwellings, offering to exchange skins, fish and other things, while our people entirely ignorant of their plans received them in a friendly manner. "When the day appointed for the massacre had arrived, a number of the savages visited many of our people in their dwellings, and while partaking with them of their meal the savages, at a given signal, drew their weapons and fell upon us murdering and killing everybody they could reach sparing neither women nor children, as well inside as outside the dwellings. In this attack 347 of the English of both sexes and all ages were killed. Simply killing our people did not satisfy their inhuman nature, they dragged the dead bodies all over the country, tearing them limb from limb, and carrying the pieces in triumph around. " From contemporaneous account: "Two Tragic Events: 1. The Seafight of Capt. Anthony Chester, 1621 2. The Indian Massacre, 1622," 1620, 1622. The Following is fromîThe Pamunkey Davenport Chroniclesî by John Scott Davenport, Ph. D. Margo McBride Editor. Crystal Lake, Il 60014. "Pamunkey Neck, that long finger of land between the Mattaponi and Pamunkey Rivers above where they join to become the York River (in 2001 King William County, the southern half of Caroline county, and southernmost Spotsylvania County), was set off by Treaty between the Governor of Virginia and the King of the Pamunkey Indians in 1623. The Pamunkeys (of Pocahontas fame) were the largest and strongest of all the tribes in Powhatanís Confederation opposing English settlement and exercised the major role in the Massacre in the English Settlements on Good Friday, 1622. Their pacification was imperative if Virginia English settlement was to succeed. By the Treaty of 1632, Pamunkey Neck was declared to be an Indian reserve, protected from settlement or hunting trespass by the English. There was , in fact, a mandatory death sentnce in place until 1648 for any White Man caught settling or trespassing in the Neck. But the Pamunkey King himself began to make exceptions, needing help from the English and their muskets to drive off raiding Senecase from the North, the fierce Tuscaroras from the South, and other nomad tribes of Iroquoian stock who kept the Neck in turmoil (the Pamunkey and their allies were of Algonquin roots.) The Indian King allowed so mny White Men into his preserve-their only bar was that no English settlement be within three miles of an Indian town-that Virginia authorities recognized that the Pamunkeys bey their self serving allowances had made the death penalty a face.Then too, the tribeís repeated attacks upon settlers bordering the Neck had created a demand among settlers that the Pamunkeys and their allied tribes be pacified by being made civilized, which required close interface between the Indians and the English. The death sentence relative to settlement and hunting in the Neck was repealed in 1648. "Various Pamunkey Kings sold, traded , or gave land within the tribal preserve to Englishmen starting in 1648 (when the death law was repealed), a practice continuing until 1684 when the Pamunkeys were forced by inevitable circumstance to recognize that accommodation with the English was their only chance for survival. The Pamunkey Queen began a long negotiation process with the Crown. Her husband, Totpotami, who allied with the English against invading Indians, had benn killed in battle in 1656. Concurrently ignoring the Indians rights and defending their settlements with forts and stockades, a number of squatters invaded the Neck ." 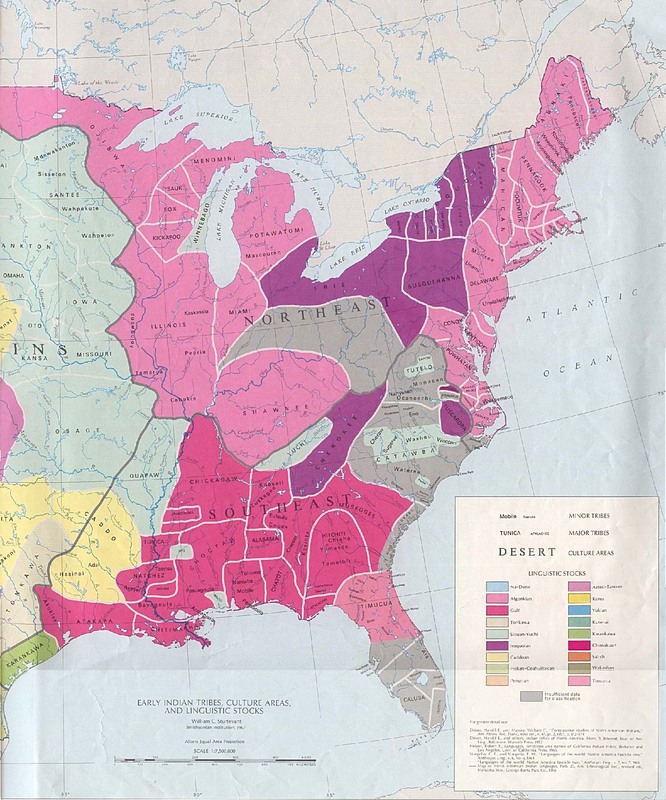 "The treaty of 1646 with the successor of Opechancanough inaugurated the policy of major historical significance of either setting aside area reserved for Indian tribes, or establishing a general boundary line between white and Indian settlements. Influenced by the desire of individual settlers to fortify their claims and by the opposition of the natives to white encroachment, the colony designated definite lands for the Virginia Indians and began to follow more closely the custom of purchasing all territory received from the natives. To see that this was done, the Assembly passed numerous laws, pertaining in most cases only to the specific tribes of Indians mentioned in each act.... The treaty of 1646 designated the York River as the line to separate the settlements of the English and the natives. But the colony at that time was on the eve of a great period of expansion. With an estimated population of 15,000 in 1650, the colony increased by 1666 to approximately 40,000, and by 1681 to approximately 80,000. To stem the tide of the advancing English settlement was apparently an impossibility. Therefore, Governor William Berkeley and the Council, upon representation from the Burgesses, consented to the opening of the land north of the York and Rappahannock rivers after 1649. At the same time the provision making it a felony for the English to go north of the York was repealed. This turn in policy, based upon the assumption that some intermingling of the white and red men was inevitable, led to the effort to provide for an "equitable division" of land supplemented by attempts to modify the Indian economy which had previously demanded vast areas of the country. " "Before Surry was split from James City, the settlers made the first of many treaties with the Southside Virginia Indians. It appears that the Southside tribes of Indians were relatively weak, and hardly had enough warriors to protect themselves. This treaty provided help from the settlers, should other marauding tribes of Indians attack them. 1 Heningís Statutes, vol. I, p. 323. "The treaty of October 1677 [ which the Queen of Pamunkey signed] established an annual tribute of twenty beaver skins to be paid to the colonists. The English also claimed the right to appoint Necotowance's successors. This treaty made the English the sole owners of the Lower Peninsula between the James and the York Rivers. The Settlement Law gave the Powhatans freedom to inhabit land north of the York River, but it did not restrict the English from also settling there. The English were free to expand after notifying Necotowance, or his successor, of their intentions. An agreement was made among the English to wait until after the Powhatans had forgotten the recent wars before moving northward." 4. The Indian Tribes of North Americaby John R. Swanton Virginia Tribes Manahoac through Tutelo. Presented by the website Searching for Saponi Town"
10. Helen C. Rountree, Ph.D. Professor Emerita of Anthropology , Old Dominion University , Norfolk, Virginiain her articleIn Helen Rountree's response to Accohannock history found at the New Mexico Genealogical Society's pages. 14. Martin's Hundred from History.net. "This article was written by J. Frederick Fausz and originally published in American History Magazine in March 1998. " Reprinted under the Fair Use doctrine of international copyright law. 16. The History and Present State of Virginia by Robert Beverly . Edited by Louis B. Wright. Chapel Hill: University of North Carolina Press, 1947. 17. In River Time The Way of the James by Ann Woodlief Algonquin Books of Chapel Hill, 1985 . Chapter 5. Reprinted under the Fair Use doctrine of international copyright law. 18. The Church of England, Diocese of Rochester, webpage entitled St George's Church Gravesend. The Story of Princess Pocahontas.